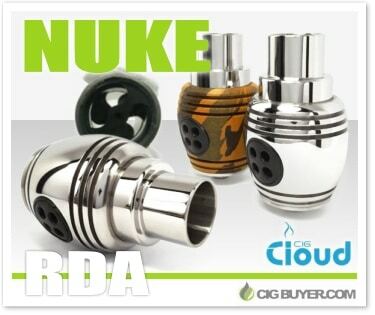 Produced by iCloudCig, first thing you’ll notice about the Nuke RDA is its uniquely rounded shape. What really sets it apart, though, are the integrated triple turbine fans. Similar to the Turbo RDA (which has just one fan), they’re designed to drastically increase vapor production and are placed on both sides and under the top cap. It features a 3-post deck design with a center “T” post, deck mill negatives and large juice well. It also includes adjustable airflow, PEEK insulator and copper 510.